Product Layout is a powerful feature that enables the user to customize the display options and descriptions of the product. 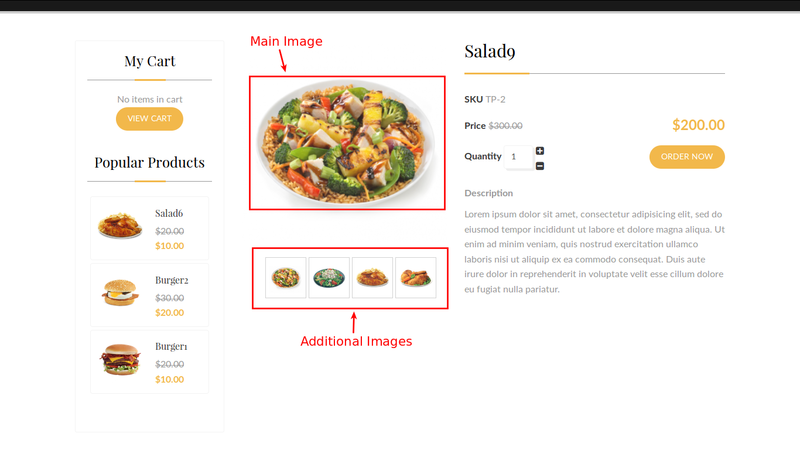 In this section, you'll learn how to create and customize a product layout. Note: Product layout works only with Joomla articles. If you use SEBLOD / FLEXIcontent / or any other catlog systems, then you may need to configure the product layouts using their menu items. 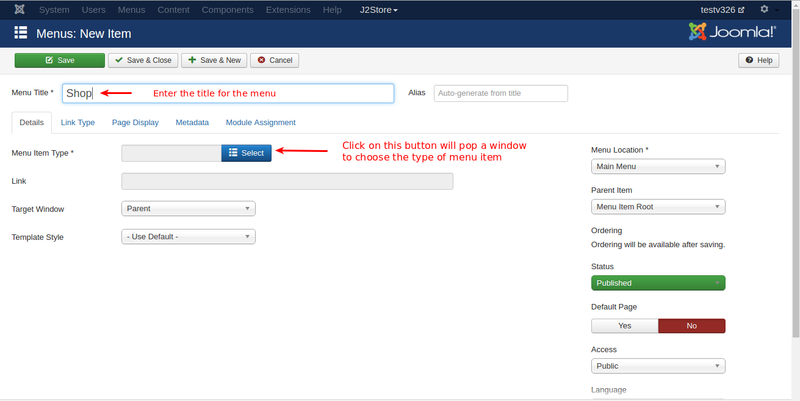 To create a product layout, go to joomla control panel and click on the menu item Menus -> Main Menu as shown in the image below. You will get the list of menus that are already present as shown in the image below. To create a new item, click on the New button and you will get this page. First you need to enter the title of the item you create. For example, it is entered with Shop. The alias will be automatically generated based on the title. Then, you have several tabs in this page. Let us see one by one. First is the Details tab. In this pop-up window, select J2Store and you will get a list to choose from. From the list, select Products List View and close the window. You will see your selection as shown in the below image. Your menu item is selected and the link is also created automatically. click on the Choose a Category text box to choose the product categories listed. You can add many categories in this box. Refer the image below. Now, go to next tab, Common Options. This tab has the common settings for all items. If you want to show images for product options or if you want to add some custom CSS code, you can do that here. Otherwise, you can leave them as they are. In this tab, you are setting the configuration for how to display the product in the cart and the features and options to display with the product. You can display any number of products as you like in the shop. Enter the no of products to be displayed in the text box provided and the number of columns in which the product display is divided. As the no of products increases, the image display size will be decreased. Also, select all other options as per your choice. Refer the next image. From the image you can see that there are many options available to set the price, image, size of the image and many more attributes. CAUTION: SKU Show/Hide setting can be done in two places, i.e., in configuration setup and in product layout. Product layout setting will be given higher priority, i.e., if SKU is set to Show in configuration and again it is set to Hide in product layout, the configuration setting will be overridden and the SKU will be set to Hide as it is in product layout. As a result, SKU will not be shown in frontend. Next image shows the filters. Filters help narrow the search for a particular product. There are many filters available for the search. One or more filters can be applied as per the needs of the customer. In this tab, you will set the configuration for what to display with the product, like price, description, image etc. Using this parameters, you can determine what are the details and how they should be displayed in the online shop. Apart from these four tabs, there are four more tabs and they should be left with the default settings. You need not worry about that. Now, Save the item by clicking the Save & Close button. You will get the screen as shown in the image below. In this image, you can see that the new menu item created is listed in the top with the other menu items. You can click that to see the products of your store, like the image below. In this page, you can see the product layout features. The filters are positioned in the right side as per the selected choice. You have the option to filter by price, brand, vendor etc. The regular and special prices are also displayed along with discount percentage variation. 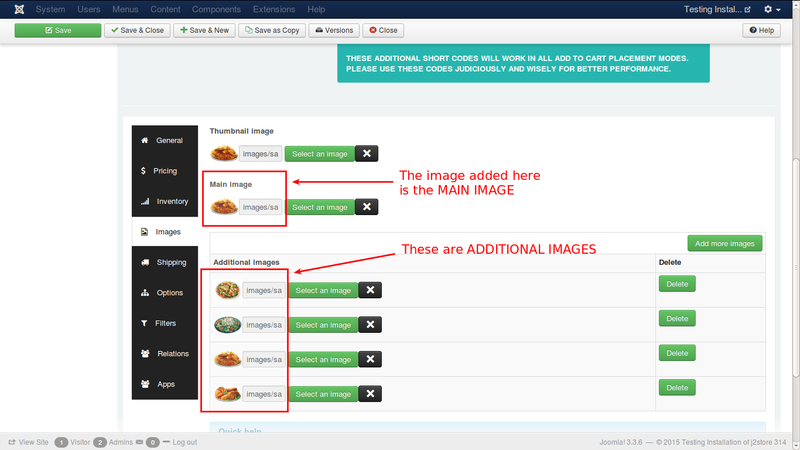 Let us see how images are added in the backend and how they are displayed in frontend view. In the image, you can see Main and Additional images added to the product configuration. 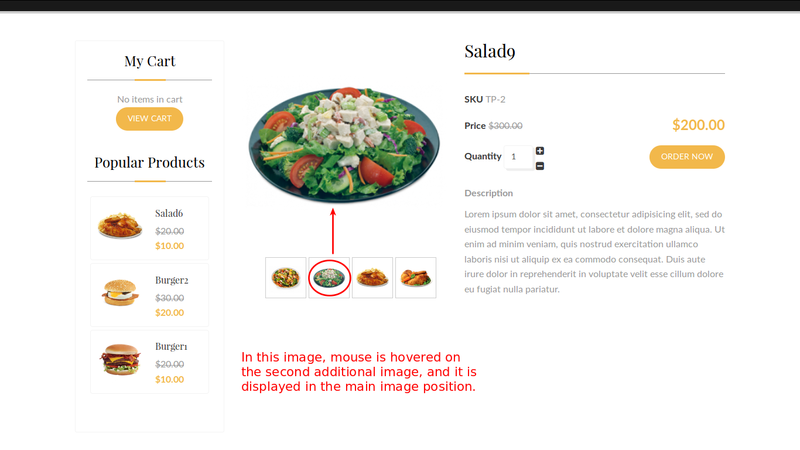 When you configure your product, you will add images of the product for its view in the cart. You add main image of the product for the main view supported with additional images. Let us now check how it is viewed in the front end. When you click on the product, it will be displayed with large image and additional images displayed below in small size. When you hover over the small images, you can see them in place of the main image. The below image explains this activity. Like this, you can set different product layouts according to your wish and needs. To avoid the zomm effect and to bring the image in pop up, first thing you have to do is disable the zoom effect in admin backend. 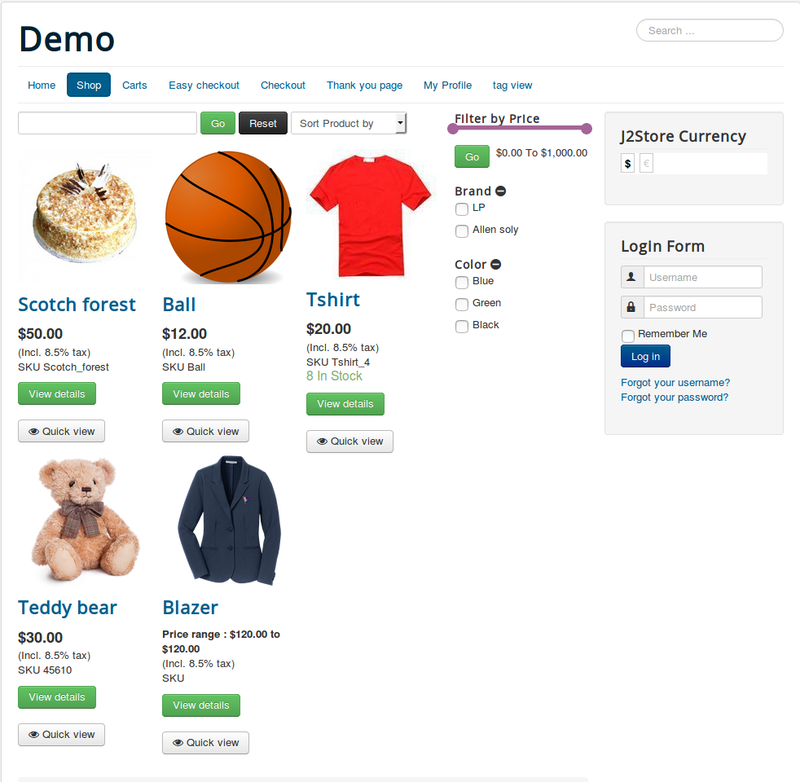 Go to menu manager and open the menu which links to J2store product layout. Set NO to Enable Zoom effect. Open the Content - J2Store plugin. Set NO to Enable Zoom effect in Item view tab. class="j2store-product-main-image j2store-img-responsive" src="/<?php echo $image_path.$main_image;?>"
<a href="<?php echo $this->product->main_image;?>" class="modal"><img itemprop="image"
The issue seems to be the wrong sub-template. Open your product list layout menu. 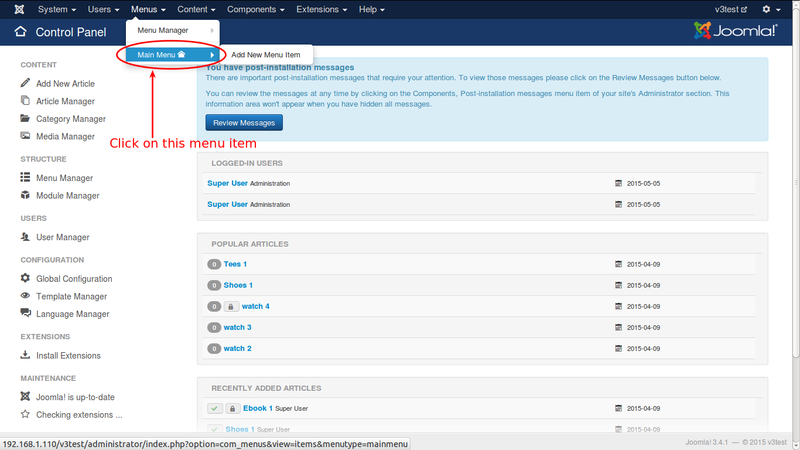 In Common options tab -> set the sub-template as Bootstrap3. This should solve the issue. If it is already set to Bootstrap 3, then try to set it as Default. edit the file and remove the highlighted line fully. 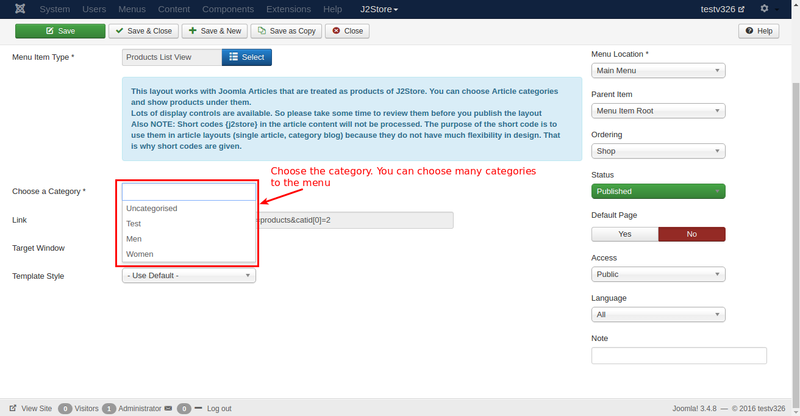 Create custom module and assign it to the menu which links to J2store product layout. Set the module position to j2store-product-list-top. Now the custom module will display the description only in list view.